Make the best out of your property by getting our professional excavation services. 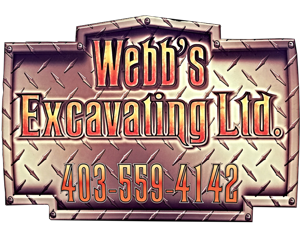 Webb’s Excavating is the partner you need to start all your construction projects: our excavation company located in Olds, Alberta, provides you with high quality work at competitive prices. We service Central Alberta, and travel throughout the province to help clients in residential, commercial and industrial sectors. No job is too big or too small for us! Like a trusted friend who is always there when you need help, count on Webb’s Excavating to answer all your needs. We specialise in excavation contracting, of course, but also in foundation contracting. This way, we can help you make sure your residential or commercial building will be built on solid groundwork. We are also experts in utility installation, including directional drilling. We know how essential it is that you are provisioned for your everyday needs, either energetic or others: gas, electricity, water or telecommunications. Finally, we also offer landscaping and snow removal services. We ensure the success of your excavation project, whatever its size and purpose. We are a proud Albertan company, working in this field since 2003. Our long years of experience are combined with constant evolution: by always improving our skills and knowledge, we are sure to meet and exceed your expectations. This is why we use the latest excavating equipment as well as environmentally friendly materials. Besides, all of our work is guaranteed. Using the proper equipment efficiently is the key to our high-quality achievements. Underground of overhead, entrust any utility installations on your property to us! Contact us and request your free estimation today!